Jesse Smith, an installer for Sundance Spas, points out the jets on the spa and how they work to Jonathan Kadis. Kadis was gifted the spa from Sundance Spas and Wish for Our Heroes. .
A local disabled veteran, Jonathan Kadis, was gifted a hot tub from Logan’s Sundance Spas and Wish for Our Heroes for a disability. Kadis spent 31 years of his life in the service of his country. He was diagnosed with an auto immune disorder, causing two neurological issues. 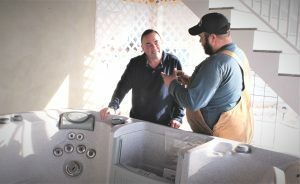 Jesse Smith, an installer for Sundance Spas, talks to Jonathan Kadis about the features of the spa and how to use them. His doctor suggested water therapy, so he went shopping for a hot tub. While Kadis was shopping for the hot tub at Sundance Spas in Salt Lake City, the salesman suggested he and his wife, Tami, fill out an application for Wish for Our Hero (W4OH). They might help him with his spa purchase, they said. Then they got the word his application was accepted. Friday afternoon, a crane parked on 1000 East in Smithfield lifted a new hot tub over the fence and into Kadis’ yard, near the cement patio where it ended up. Sundance Spas puts money aside from the sale of their spas to support W4OH. The charity organization was incorporated in 2009 as a non-profit organization. Their sole purpose is to grant wishes for active-duty military, veterans and their families. They strive to relieve the burdens of military families, offering assistance not offered by existing military charities. Kadis served in both the National Guard and full-time service. He was in two different branches of the military: the Air National Guard and the Coast Guard. He also worked 25 years in higher education at both Utah State University and University of Idaho. “I worked at the Utah State University for 16 years as an executive in Multimedia and Distant Learning Services,” Kadis said. “I left the university and went to Tennessee with the Air National Guard.” He was diagnosed with the auto immune disease when he was living in Tennessee. The disease attacks the internal organs and spine. He uses a cane to get around. He said he is looking forward to using the spa. He is hoping it will give him some relief from his pain.